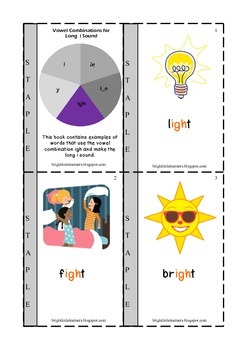 Here is a set of 5 mini books, 1 for each vowel combination (i,ie,i_e,igh,y) with lots of examples. When teaching the Long sounds for vowels in detail, these books come in very handy as children can exclusively concentrate and learn about each vowel combination at a time. The books will help kids build a strong foundation for their reading and spellings and will make them remember that different vowel combinations can give us the same sound. The children will enjoy this concept presented in a mini book style and can always go back to the book for easy reference. You will also see their confidence in reading and spelling building up. Hope the children really enjoy the product. Happy Teaching! 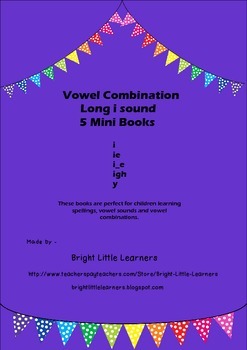 You can also find similar books for Long A, Long E, Long O and Long U sound. All these are also available as a set of 5 for a reduced price of $10.